The brainyBrainers solution is a non profit organisation that is equipped with a team of trained professionals who are passionate about quality education in the northern Nigeria. The Goal of the organisation is Providing qualitative training and development programs for the youths and students. This lead to the birth of the Arewa spelling bee which is the largest school participatory bee in the northern Nigeria. 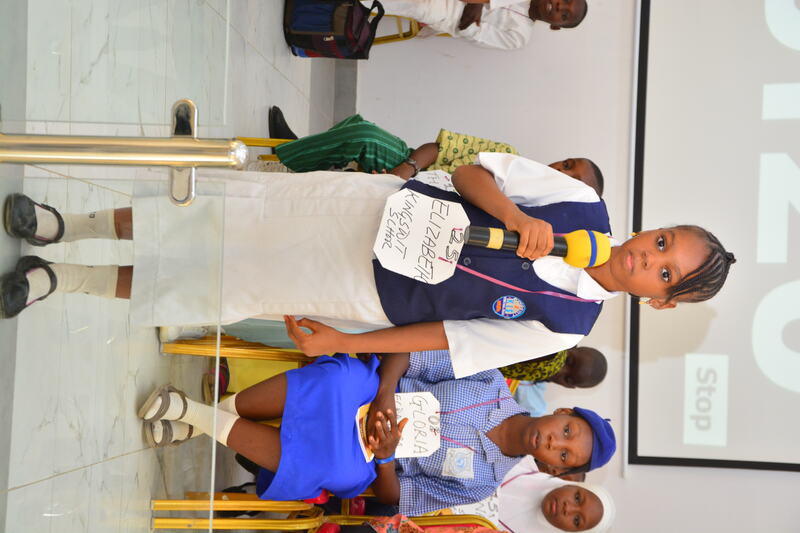 The spelling bee aims to eradicate the impending English language barrier on the northern Nigeria, It helps students understand structure and architecture of many languages. It charges their understanding of spelling and it dramatically changes. They learn concepts that will help them all their lives. AREWA SPELLING BEE CORE AIMS AND OBJECTIVE To improve and advance the skills associated with good spelling habits To enhance students development of poise and communication under pressure. To expand student vocabulary and encourage accurate word usage and pronunciation. To provide an opportunity for children to meet and work as a team , and encourage them to be involved in extracurricular activities. These activities offer opportunities for students to learn the values of teamwork, individual and group responsibility, physical strength and endurance, competition, diversity and a sense of culture and community. It provides a channel for reinforcing the lessons learned in the classroom. Offering students the opportunity to apply academic skills in the real world context. The brainy brainers solutions have Been able to build confidence in the hearts of the young ones as they are eager to participate in the 2018 event. Feedbacks came from school teachers and parents about the improved vocabulary of thier kids and zealousness to read and communicate better. In some schools, more spelling bee clubs have been setup and more students are joining in order to participate and learn more. AREWA SPELLING BEE is the first educational event of its kind in the northern region of Nigeria approved by the ministry of education (Kano state). It is administered on a not-for-profit basis by the BrainyBrainers solutions and sponsors in the state and nationwide. Arewa spelling bee sponsors are corporations, community, organisations. It is going to be continuous event and shall hold at strategic period of summer Categories of participants The categories of participants will be within the Secondary school classes, JSS 2 and 3 (within 9 to 15years) Each school provides two participants each, two cheer party, and a representative from family. To crown the winners, processes will take a couple of weeks, from the school training, to the teacher- student training using the competitions study guide, spelling brochure and template, To the Mock competition before the Final contest where one contestant would emerge winner and be crowned BEST AREWA SPELLER.There shall be lots of other consolation prizes for the winner, runner ups and participants. Career day and other educational programs will be organised during strategic periods when students are not preparing for the bee. Faith Ene Ejih has over 4years experience in youth and social development. She is will be 26 years by August 2018, Faith is the founder of the BrainyBrainers solutions, a non - profit youth development organization aimed at coming up with qualitative trainings and educative programs for youths and students. She recently birthed the Arewa Spelling Bee a yearly event for junior secondary schools which focuses on improving good English, /vocabulary usage, poise and communication under pressure. Faith believes that change begins with simple ideas and duplicates itself for the greater good of the larger part of the community. She has proven herself by staying positive and committed in what she does and is determined in contributing her skills, knowledge and time impacting in her community through mentoring youth Corps members of the NYSC on business, entrepreneurship and helping them with accommodation. She has skills in events management, Team formation, volunteer management and educational planning. Faith Ene Ejih holds a B.Sc. In Biochemistry, and is currently doing her MBA in project management,in Bayero university, Kano state. This experience, which unfortunately only lasted 2 weeks for me, taught me a lot and ripen my idea. Whatever the outcome of the vote, I will come out of here stronger and capable to put in place that. I wish you all the best.Thank God...and thanks to my friends. I am truely blessed to be here. Arewa Spelling Bee is encouraging Pupils to commit to the art of spelling and word recognition. This is a great way to improve pupils\' vocabulary and communication skills. 3. Have your concept about entrepreneurship changed in any way after interacting with the community members here? We work hard to meet expectations like yours, and were happy to hear we hit the mark for you. Come back and see us soon..
And we both being participants in same competetion and we talking about sustainable development, i thought it is always good to have a cordial relationship with the participants. You can also comment and vote on our idea PARKNER. Always great to see projects that will impart the minds of young kids, spelling bee is a great way to develop the brain of children positively especially in the northern region of Nigeria. Kudos to the founded. It's great to see young minds appreciating the beauty of spelling and how it positively influences our generation in terms of boosting self confidence and creating a robust vocabulary for effective communication. Keep up the great work in effecting some of the changes we would like to see in our generation. This is a great initiative. One of the challenges of our youth is their ability to effectively communicate. Spelling Bees are a sure way of ensure they know their onions in communication and helps them build self confidence early in life. Keep up the good work in creating an enabling environment for youths of our time. I think your idea is really unique and has all the qualities to be a great Startup. Our world need people like you who are extremely creative and dedicated to change the world for greater good. I really appreciate you and your idea, I wish you all the best for your future and I hope you will successfully execute your idea. Please let me know if I can help you with anything at [email protected] I will be happy to help you. I hope you will support us too. Highly inspiring move dear. I hope all educational organization. More grease to your elbows. I'd strongly encourage support from the government on this. I hope this project wins. This is the best movement ever,..going out of your own pleasure to give the best to young minds; exploring their inborn capacity to change our world for greatness. If a child is giving the privilege to grow a thousand children are awaken to growth in that light and if two children are trained, ten thousand children are set to walk in the path to change the world for better. WELL-DOING MY FAITH ENE EJIH. A rare Gem amidst many. Faith, You deserve a Nobel Prize for filling up the gaps our past leaders left void. You're improving the minds of these little ones, opening up their precious eyes to see the treasures they possess within. You know something..? I just nominated you for MOP Prize juvenile capacity development. I hope it emerges the best project. .
We can only get better.I believe change starts with an idea which can transform into mighty inventions. Your idea is great and innovative. I am very hopeful that it will create a revolution in the upcoming days in the sector that you have been working on.. I wish you all the best and you have definitely got my vote. But I had one question for you.. What is the feature or aspect that makes you unique from all other similar type of initiatives? I will glad to know. Also, please vote and comment in my project also. Good luck... this is a truly good innovation for young minds. It is a way to encourage and mould them into better leaders tomorrow... It is something that should be encouraged and supported.... all the best, please keep it up. There is no better way to support a project that is making effort to bring back the reading culture that is gradually fading away due social and physical vices .I know this is real and it is born out of passion and zeal for a better representation of our tommorow. Great Idea. I like your overall plan and infrastructure. However, I am very interested to know what you are aiming to achieve over the next 5 years? Do let me know. I am eager to listen. Cheers and best of luck. Please provide your idea and suggestion about my project also. I'm so looking forward to this year's edition of the arewa spelling bee. This is because of how inspiring that of last year was. Keep the fire burning my dear Faith, I stand with you always amf I love your passion and desire to change the world positively.. Your idea is good. When I read your idea I just remember all the spelling bee contest of my elementary and high school years. Continue improving and supporting education. Education is basic for a country to develop. God bless the vision carrier. GOD BLESS OUR COUNTRY NIGERIA! what a good start for success .. thumbs up faith .. its really a good idea and am sure this will groom up coming kids and give them a better life !! God bless you! Arewa spelling bee is a great project and I strongly believe this project will improve the spelling skills of upcoming kids who eventually will become our leaders of tomorrow. I hope this idea is sustainable and keeps impacting in more lives. Arewa Spelling Bee is a timely project, and its content will see to enhancing child development at very early stages. The impact of such a competition has seen even more students pay rapt attention to building their vocabulary. Its a win win for the North. Arewa spelling bee is a great project and I strongly believe this project will improve the spelling skills of upcoming kids who eventually will become our leaders of tomorrow. This is a fantastic project coming in an era where short codes such as "lol", "brb" commonly used in social media chats is eating deep into our spellings and constructive sentences. Kudos to you Faith. This is a great project. This will really improve the literacy level among Children in the North. Northern Nigeria continues to hold one of the worst literacy rates in the country. I am excited by initiatives like the Arewa Spelling Bee that aim to improve the unfavourable stats. Welldone to the organisers! I am so Proud of you. Arewa Spelling Bee is such a great idea. Very educational and purposeful. You Deserve the award and even more. Greater heights dear. You are Blessed and made for the Top. Thank you for the good job you are doing by touching lives of young people. I wish you colourful colours. Splendid idea. Long overdue need for the teaming youth in Nigeria. I believe that with adequate support and sponsorship from relative governmental bodies, The Spelling Bee will improve the confidence of young ones both in spelling and their general outlook on life. Friends hold a special place in our hearts, not just because of the good times we share but also for the bonds that are formed when we go through pain and adversity holding each other up. There are people in your life whom you count as great friends. They may be young or old, close or distant. Whoever they are and wherever they are, these words are for you to encourage them. Use these words to thank them for their love and generosity and uplift them when they need it most. Wow! I'm amazed with your project. This is a great course to improve life and quality of the younger generations out there. Keep the good work going and ball rolling... Wishing you success. The top is where you belong. We will keep at this and Make sure this is sustainable. The brainyBrainers solution is a non profit organisation that is equipped with a team of trained professionals who are passionate about quality education in the northern Nigeria. Thank you so much for your interest in my idea (AREWA SPELLING BEE ). I really appreciate your good comment and I am so happy that you support me idea. you will bring home this prize. YOU ARE GOOD, I CAN ONLY WISH YOU THE VERY BEST.Keep bringing out the best in these kids, we can never repay you but God will bring people your way and make your way prosperous. Thank you so much for your interest in my idea (AREWA SPELLING BEE ). I really appreciate your good comment and I am so happy that you support me idea. I hope with this idea can be useful for all people around the world. Thank you so much for your interest in my idea (AREWA SPELLING BEE ). I really appreciate your good comment and I am so happy that you support me idea. Thank you for being an every day inspiration. Thank you so much for your interest in my project (AREWA SPELLING BEE ). I really appreciate your good comment and I am so happy that you support me idea. I hope with this idea can be useful for all people around the world. The comments are really heart warming and loving. This goes a long way to helping me do more and impact in my society better. IReally appreciate this. Thank you for standing up for me . A very proud initiative with unique and outstanding charisma, Kano state and North region entirely always anticipated for such a reasonable initiative. Until a pragmatic Faith Ejih walk in as a rescue team of our generation. More wisdom, Grace, Favour and Financial support i pray. Honestly they are the best organisation we've witnessed so far as a grassroots sensitization organisation. They say, Education is the best weapon against poverty and terrorism. And "Spelling Bee" put in a thoughtful idea's to define what Education really stand for, Morally, Intellectually and Psychologically in a sane clime. God bless your initiative as i pray UNESCO interpret such a life long initiative while posterity shall bless every souls that make it a pride of the Continent and the World at large. Great! Can't help but reminisce those times we would watch the "Akeela spelling bee movie" in Kano. Can still remember how we prayed for such innoviation during our time but never witnessed any. Am glad you, Faith have taken this up, as a passion. I see this going global. Keep up the good work. Excellent project to create a team of trained professionals in your country. Teams that will help children to maintain your country's language and spelling culture. Very inspiring and good luck. This event is one of a kind and the very first and best of extracurricular activities in Kano State, Nigeria. The spelling bee saw 26 schools signed up, 52 participants and over 300 spectators in attendance. This year's edition promises to be better than last year.